School of Medicine and Pharmacy 1, Vietnam National University, Hanoi, Vietnam. Vietnam Military Medical University 2, Vietnam. ABSTRACT: The mulberry has been widely cultivated to feed silkworms. The leaves of mulberry have been used in traditional medicine as an analgesic, antitussive, cathartic, diuretic. In this study we have isolated three compounds (LC1-3) by chromatographic methods from the mulberry leaves (Morus alba L.) collected in Thai Nguyen province, Vietnam. These compounds were identified as: Kaempferol-3,7-di-O-α-L-rhamnopyranoside (LC1), 7, 4’- dihydroxy-5, 3’- dimethoxyflavone (LC2), (S)-5,5’,7-trihydroxy-2’,4’-dimethoxy-6-methylflavanone (LC3). Their structures were elucidated by spectroscopic methods, including MS and NMR. Compound LC3 was isolated from mulberry leaves for the first time. These compounds were evaluated the tyrosinase inhibitory activity in-vitro. 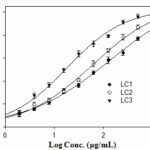 Our data showed that compound LC3 has potential tyrosinase inhibitory effects with IC50 values of 15.48 ± 2.96 µg/mL. INTRODUCTION: In East Asia, whitening skin and protection against skin darkening are considered desirable by some for cosmetic purposes. Because tyrosinase plays a critical regulatory role in melanin biosynthesis, many tyrosinase inhibitors that suppress melanogenesis have been actively studied with the aim of developing preparations for skin whitening by many cosmetic companies. Plant extracts having an inhibitory effect on enzyme tyrosinase may be a good choice for this purpose because of their relatively lower side effects. In cosmetic preparations, many plant extracts such as Mulberry (Morus alba Linn.) leaves have been used as whitening agent 1. Mulberry (Morus alba L., family of Moraceae) is a native plant in Vietnam. It leaves have long been used in traditional medicine for treatment of several diseases such as fever, protect the liver, improve eyesight, strengthen joints, facilitate discharge of urine and lower blood pressure 2. Leaves of mulberry species have been widely consumed as antihyperglycemic nutraceutical foods for patients with diabetes mellitus 3. Previous studies reported that Morus alba L. had many pharmacological activities, including anti-hyperglycemic 4, anti-oxidant and antiglycation activities 5. 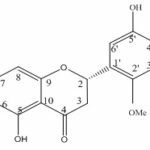 Phytochemical studies of this plant mainly showed the presence of flavonoids, anthocyanins, anthroquinones, triterpenes, tannins, phytosterols, sitosterols, benzofuran derivatives, morusimic acid, oleanolic acid, alkoloids, steroids, saponins and phenolic compounds 6, 7. However, in Vietnam, there have been very few studies on this species. Therefore, this paper reports on the phytochemical investigation of the leaves of Morus alba Linn. and on the evaluation of the tyrosinase inhibitory activity of isolated compounds. Plant Material: The leaves of Morus alba L. were collected in Thai Nguyen province during 6/2016 and authenticated by Dr. Vu Duc Loi, Department of Pharmacognosy and Traditional Medicine, School of Medicine and Pharmacy, Vietnam National University, Hanoi (SMP-VNU). A voucher specimen has been (No. SMP-2017-0016) deposited at the Herbarium of SMP-VNU. General Experimental Procedures: General experimental procedures were performed as previous study with some modifications 8. Melting points were measured on Mikroskopheiztisch PHMK-50 (VEB Waegetechnik Rapido, Germany). The FT-IR spectra were recorded on an IMPACT-410 FT-IR spectrometer (CARL ZEISS JENA). The NMR [1H (500 MHz), 13C (125 MHz), and DEPT-90 and 135 MHz)] spectra were recorded on an AVANCE spectrometer AV 500 (Brucker, Germany) in the Institute of Chemistry, Vietnam Academy of Science and Technology (VAST). Chemical shifts were reported in ppm downfield from TMS with J in Hz. Extraction and Isolation: The extraction and isolation procedure was performed as previous study with some modifications 9. Mulberry leaves (6.0 kg) was dried, powdered and then extracted with methanol (48 h x 4 times). The resulting extract was concentrated under reduced pressure using rotary vacuum evaporator to get crude extract (520 g). The methanol extract was dissolved in water and subjected to liquid-liquid partitioning (3 times) using n-hexane, ethyl acetate, yielding 60.0 g (A) and 75.0 g (B) of residue, respectively. The aqueous fraction was concentrated to yield 42.0 g of residue (C). The aqueous residue (30 g) was suspended in H2O and poured into a Diaion HP-20 column which was stabilized with H2O. The column was eluted with methanol/H2O (1/4 → 1/1, v/v) to obtain 4 fractions (C1 → C4). Fraction C3 (9.5 g) was further separated over YMC column and eluted with Methanol/H2O (2:1, v:v), to yield four sub-fractions (C3.1→C3.3). Fraction C3.1 (1.2 g) was chromatographed on revert phase column (acetone/H2O, 3/5, v/v), yielding LC1 (30 mg). Fraction C3.2 (1.6 g) purified by silica gel column and eluted with n-hexane/acetone (5/1, v/v) to yield LC2 (21 mg). Fraction C3.3 (1.4 g) was submitted to chromato-graphy on YMC-RP-18 column, eluted with acetone/H2O (1/1, v/v), yielding LC3 (19 mg). Where Ac represents the difference in the absorbance of the control sample between an incubation time of 0.5 and 1.0 min and At represents the difference in the absorbance of the test sample between the incubation time of 0.5 and 1.0 min and Ao represents the absorbance of the blanks. Each result is the mean of three concurrent readings. Kojic acid was used as a positive standard. 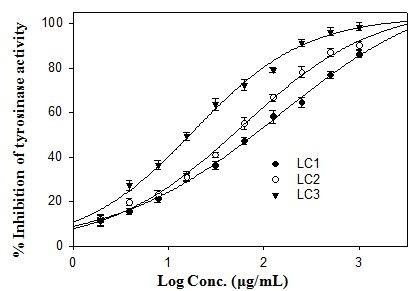 The effects of compounds were expressed by IC50 values. IC50 is defined as the concentration of inhibitor that reduces enzyme activity by 50%. LC1: Kaempferol-3,7-di-O-α-L-rhamnopyrano-side: Light yellow powder. UV λmax (MeOH): 265, 328, 343 nm. ESI-MS m/z: 577.5 [M-H]-. 1H-NMR (500 MHz, CD3OD): δ 6.45 (1H, d, J = 2.0 Hz, H-6), 6.77 (1H, d, J = 2.0 Hz, H-8), 7.79 (1H, d, J = 9.0 Hz, H-2’), 6.92 (1H, d, J = 8.5 Hz, H-3’), 6.92 (1H, d, J = 8.5 Hz, H-5’), 7.79 (1H, d, J = 9.0 Hz, H-6’), 5.30 (1H, s, H-1”), 3.16 (1H, m, H-2”), 3.43 (1H, m, H-3”), 3.31 (1H, m, H-4”), 3.31 (1H, m, H-5”), 0.81(3H, d, J= 5.5 Hz, H-6”), 5.54 (1H, s, H-1’’’), 3.16 (1H, m, H-2”’), 3.16 (1H, m, H-3’’’), 3.31 (1H, m, H-4’’’), 3.63 (1H, m, H-5”’), 1.13 (3H, d, J = 6,5Hz, H-6”’). 13C-NMR (125 MHz, CD3OD): δ 157.89 (C-2), 134.66 (C-3), 178.02 (C-4), 161.80 (C-5), 99.52 (C-6), 161.80 (C-7), 94.70 (C-8), 156.22 (C-9), 105.88 (C-10), 120.48 (C-1'), 130.79 (C-2'), 115.48 (C-3'), 160.19 (C-4'), 115.48 (C-5'), 130.49 (C-6'), 101.96 (C-1’’), 70.76 (C-2’’), 70.31 (C-3’’), 71.23 (C-4’’), 71.23 (C-5’’), 17.50 (C-6’’), 98.53 (C-1’’’), 70.76 (C-2’’’), 70.76 (C-3’’’), 71.23 (C-4’’’), 70.31 (C-5’’’), 17.94 (C-6’’’). The ESI-MS data showed the ion peak [M-H]- at m/z 577.5, which matched with the molecular formula of LC1 as C27H30O14. The 1H-NMR spectrum of LC1 showed meta-coupled aromatic protons (A-ring) at δH 6.45 (1H, d, J = 2.0 Hz, H-6) and δH 6.77 (1H, d, J = 2.0 Hz, H-8),; ortho-coupled aromatic protons (B-ring) at δH 7.79 (2H, d, J = 9.0 Hz, H-2’, 6’) and δH 6.92 (2H, d, J = 8.5 Hz, H-3’, 5’), suggesting the structure of kaempferol aglycone to LC1. The presence of two rhamnose moieties was also suggested by two anomer proton signals at δH 5.30 (1H, s, H-1”) and δH 5.54 (1H, s, H-1’’’), two methyl group at δH 0.81(3H, d, J= 5.5 Hz, H-6”) and 1.13 (3H, d, J = 6,5Hz, H-6”’). The 13C-NMR and DEPT spectra together with ESI-MS supported the presence of one flavonoid nucleus and two hexose units in LC1. A HMBC experiment performed with LC1, showed correlations between the anomeric proton at δH 5.30 (1H, s, H-1”) and the quaternary carbon atom at δC 134.66 (C3); the proton at δH 5.54 (1H, s, H-1’’’) and the carbon atom at δC 161.80 (C7), indicating the sites of glycosidation. By comparison with previously reported literature 10, 11, the structure of LC1 was deduced as Kaempferol-3,7-di-O-α-L-rhamnopyranoside. 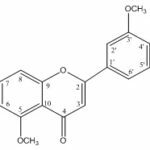 LC2: 7,4’-dihydroxy-5,3’-dimethoxyflavone: Ye-llow powder. Rf = 0.45 (chloroform / methanol / H2O, 10 / 1.5 / 0.01, v/v), ESI-MS (positive) m/z: 315 [M+H]+ 1H-NMR (500MHz, CD3OD) :δ 7.48 (1H, dd, J = 2.0, 8.5 Hz, H-6'), 7.45 (1H, d, J = 2.0 Hz, H-2'), 6.94 (1H, d, J = 8.0 Hz, H-5'), 6.58 (1H, d, J = 2.0 Hz, H-8), 6.57 (1H, s, H-3), 6.43 (1H, d, J = 2.0 Hz, H-6), 3.97 (3H, s, 3’-OCH3), 3.91 (3H, s, 5-OCH3). LC2 was also obtained as yellow powder and its molecular formula was established as C17H14O6 from its MS spectral data that showed [M+H]+ ion at m/z 315. The 1H NMR spectrum of LC2 showed the presence of three meta coupled aromatic doublets at δ 6.43 (1H, d, J = 2.0 Hz, H-6), 6.58 (1H, d, J = 2.0 Hz, H-8) and 7.45 (1H, d, J = 2.0 Hz, H-2'), one ortho coupled aromatic doublet at δ 6.94 (1H, d, J = 8.0 Hz, H-5'), one doublet of doublets at δ 7.48 (1H, dd, J = 2.0, 8.5 Hz, H-6') corresponding to a ortho and meta coupled aromatic proton, and a singlet at 6.57 (1H, s, H-3); characteristic for a 5,7,3',4'-tetrasubstituted flavone. In addition, the 1H-NMR showed the presence of two methoxy groups at δ 3.97 (3H, s, OCH3), 3.91 (3H, s, OCH3). The NOESY correlations between 3’-OCH3 (δH3.97)/H-2’ (δH7.46) and between 5-OCH3(δH 3.91)/H-6(δH 6.37) indicated the position of two methoxy groups. Based on the spectroscopic evidence and comparison with literature values 12, 13, 14 LC2 was determined to be 7,4’-dihydroxy-5,3’-dimethoxyflavone. 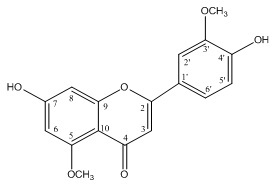 LC3: (S)-5,5’,7-trihydroxy-2’,4’-dimethoxy-6-me thylflavanone: Yellow powder. Rf = 0.5 (chloro-form/methanol/H2O, 5/ 1/ 0.05, v/v), [α]25D=–88.0(c 0.1, MeOH). CD(c 1.4×10-3 M, MeOH): λmax (∆e) nm 295(–13.7), 345(+2.1). IRnmax (KBr): 3393, 1637, 1516, 1303, 1158 cm-1. HR-ESI-MS m/z: 347.1109 [M+H]+ (calcd.347.1130 for C18H19O7). 1H-NMR (500 MHz, CD3OD): δ 7.00 (1H, s, H-6'), 6.69 (1H, s, H-3'), 5.97 (1H, s, H-8), 5.60 (1H, dd, J = 3.0, 13.0 Hz, H-2), 3.90 (3H, s, OCH3), 3.83 (3H, s, OCH3), 2.95 (1H, dd, J = 13.0, 17.0 Hz, Hb-4), 2.68 (1H, dd, J = 3.5, 17.5 Hz, Ha-4), 1.97 (3H, s, CH3). 13C-NMR (125 MHz, CD3OD): δ 75.2 (C-2), 43.4 (C-3), 198.0 (C-4), 162.6 (C-5), 105.3 (C-6), 166.1 (C-7), 95.2 (C-8), 162.6 (C-9), 103.0 (C-10), 120.5 (C-1'), 151.2 (C-2'), 98.7 (C-3'), 149.5 (C-4'), 141.4 (C-5'), 114.5 (C-6'), 6.9 (6-CH3), 56.9(2'- OMe), 56.6 (4'-OMe). LC3 was isolated as yellow powder. LC3 was assigned the molecular formula, C18H18O7, based on the HR-ESI-MS spectra of the compound obtained in the positive ion mode (m/z 307,0810 [M+H]+.calcd for C18H19O7). The 13C-NMR and DEPT spectrum showed 18 carbon signals including twelve aromatic carbons (δC 103.0-166.1), one ketone group (δC 198.0), one oxygenated methine group (δC 75.2), one methylene group (δC 43.4), two methoxy groups (δC 56.9, 56.6), one methyl group (δC 6.9). The 1H-NMR spectrum showed two methoxy group signals [δH 3.90, 3.83 (each 3H, s)], three singlet aromatic proton signals [δH 7.00, 6.69, 5.97 (s)], and one methyl singlet signal (δH 1.97). Two geminal protons at δH 2.95 (1H, dd, J = 13.0, 17.0 Hz, Hb-4), 2.68 (1H, dd, J = 3.5, 17.5 Hz, Ha-4) together with proton δH 5.60 (1H, dd, J = 3.0, 13.0 Hz, H-2) suggested LC3 was a flavanone. The HMBC correlations between H-6’ [δH 7.00 (s)] and C-2 (δC 75.2), C-1' (δC 120.5), C-5’ (δC 141.4), C-2’ (δC 151.2), C-4’ (δC 149.5), and between H-3’ [δH 6.69 (s)] and C-1' (δC 120.5), C-5' (δC 141.4), C-2' (δC 149.5), C-4' (δC 151.2) indicated B-ring was 1,2,4,5-tetrasubstituted benzene. The HMBC correlation between two proton signals of methoxy groups δH 3.90 (3H, s, OCH3), 3.83 (3H, s, OCH3) and carbon C-2' (δC 149.5), C-4' (δC 151.2) revealed the location of methoxy groups at C-2’ and C-4’. The other substituted group was hydroxy at C-5’. The position of methyl group at C-6 was suggested by the HMBC correlations between methyl singlet signal [1.97 (3H, s)] and two oxygenated aromatic carbons C-5 (δC 162.6), C-7 (δC 166.1). The absolute configuration of the asymmetric center C-2 was confirmed as 2S by comparison of its circular dichroism data with previous literature 15. Based on above deductions and comparing spectral data to reference 15, 16. LC3 was deduced as (S)-5,5’,7-trihydroxy-2’,4’-dime- thoxy-6-methylflavanone. Tyrosinase Inhibitory Activities of Isolated Compounds: The IC50 value of acid kojic was close to that from previous studies 17, 18. Among three isolated compounds, only (S)-5,5’,7-trihydroxy-2’,4’-dimethoxy-6-methylflavanone (LC3) showed potential tyrosinase inhibitory effects. Therefore, (S)-5,5’,7-trihydroxy-2’,4’-dimethoxy-6-methylflav -anone is worthy of further studies as potential tyrosinase inhibitors. CONCLUSION: From the mulberry leaves (Morus alba Linn.) collected in Thai Nguyen province, three compounds (LC1-3) were isolated by chromatographic methods. On the basis of spectroscopic analyses and by spectral comparison with published literature, the isolated compounds were identified as Kaempferol-3,7-di-O-α-L-rhamnopyranoside (LC1), 7,4’-dihydroxy-5,3’-di-methoxyflavone(LC2), (S)-5,5’,7-trihydroxy-2’,4’-dimethoxy-6-methylflavanone (LC3). This is the first report on the isolation of LC3 from Mulberry leaves. Among three isolated compounds, LC3 also showed significant tyrosinase inhibitory effects, with IC50 values of 15.48 ± 2.96 µg/mL. CONFLICT OF INTEREST: These authors have declared that there is no conflict of interest. Lee K, Kim B, Kim J, Heo M and Kim H: Biological screening of 100 plant extracts for cosmetic use (I): inhibitory activities of tyrosinase and DOPA auto‐ International Journal of Cosmetic Science 1997; 19(6): 291-298. Katsube T, Imawaka N, Kawano Y, Yamazaki Y, Shiwaku K and Yamane Y: Antioxidant flavonol glycosides in mulberry (Morus alba) leaves isolated based on LDL antioxidant activity. Food chemistry 2006; 97(1): 25-31. Lemus I, Garcia R, Delvillar E and Knop G: Hypo-glycaemic activity of four plants used in Chilean popular medicine. Phytotherapy Research 1999; 13(2): 91-94. Singab ANB, El-Beshbishy HA, Yonekawa M, Nomura T and Fukai T: Hypoglycemic effect of Egyptian Morus alba root bark extract: effect on diabetes and lipid peroxidation of streptozotocin-induced diabetic rats. Journal of Ethnopharmacology 2005; 100(3): 333-338. Naowaboot J, Pannangpetch P, Kukongviriyapan V and Kongyingyoes B: Antihyperglycemic, antioxidant and antiglycation activities of mulberry leaf extract in streptozotocin-induced chronic diabetic rats. Plant Foods for Human Nutrition 2009; 64(2): 116-121. Kusano G, Orihara S, Tsukamoto D, Shibano M, Coskun M, Guvenc A and Erdurak CS: Five new nortropane alkaloids and six new amino acids from the fruit of Morus alba LINNE growing in Turkey. Chemical and Pharmaceutical Bulletin 2002; 50(2): 185-192. Enkhmaa B, Shiwaku K, Katsube T, Kitajima K, Anuurad E, Yamasaki M and Yamane Y: Mulberry (Morus alba) leaves and their major flavonol quercetin 3-(6-malonylglucoside) attenuate atherosclerotic lesion development in LDL receptor-deficient mice. The Journal of Nutrition 2005; 135(4): 729-734. Thanh BT, Duc VL, Thanh NH and Tien NV: In-vitro antioxidant and anti-inflammatory activities of isolated compounds of ethanol extract from Sanchezia speciosa Leonard’s leaves. Journal of Basic and Clinical Physiology and Pharmacology 2017; 28(1): 79-84. Lee WJ and Choi SW: Quantitative changes of polyphenolic compounds in mulberry (Morus alba) leaves in relation to varieties, harvest period, and heat processing. Preventive Nutrition and Food Science 2012; 17(4): 280. Ibrahim L, Kawashty S, Baiuomy AR, Shabana M, El-Eraky W and El-Negoumy S: A comparative study of the flavonoids and some biological activities of two Chenopodium species. Chemistry of natural Compounds 2007; 43(1): 24-28. 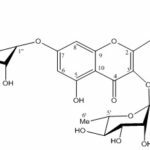 Cardoso CAL, Coelho RG, Honda NK, Pott A, Pavan FR and Leite CQF: Phenolic compounds and antioxidant, antimicrobial and antimycobacterial activities of Serjania erecta Radlk. (Sapindaceae). Brazilian Journal of Pharmaceutical Sciences 2013; 49(4): 775-782. Monache DG, Rosa DMC, Scurria R, Monacelli B, Pasqua G, Dall'Olio G and Botta B: Metabolites from in-vitro cultures of Cassia didymobotrya. Phytochemistry 1991; 30(6): 1849-1854. Carvalho MGD, Cardozo MA, Junior CFE and Carvalho AGD: Chemical constituents of Piptadenia gonoacantha (Mart.) JF Macbr (pau jacaré). Anais da Academia Brasileira de Ciências 2010; 82(3): 561-567. Ghani N, Ahmat N, Ismail N, Zakaria I and Zawawi N: Chemical constituents and cytotoxic activity of Polyalthia cauliflora cauliﬂora. Research Journal of Medicinal Plant 2012; 6(1): 74-82. Slade D, Ferreira D and Marais JP: Circular dichroism, a powerful tool for the assessment of absolute configuration of flavonoids. Phytochemistry 2005; 66(18): 2177-2215. Umehara K, Nemoto K, Matsushita A, Terada E, Monthakantirat O, De-Eknamkul W, Miyase T, Warashina T, Degawa M and Noguchi H: Flavonoids from the heartwood of the Thai medicinal plant Dalbergia parviflora and their effects on estrogenic-responsive human breast cancer cells. Journal of Natural Products 2009; 72(12): 2163-2168. 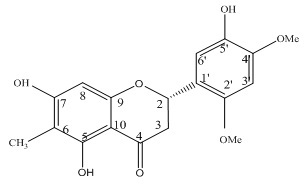 Kubo I, Kinst-Hori I and Yokokawa Y: Tyrosinase inhibitors from Anacardium occidentale Journal of Natural Products 1994; 57(4): 545-551. 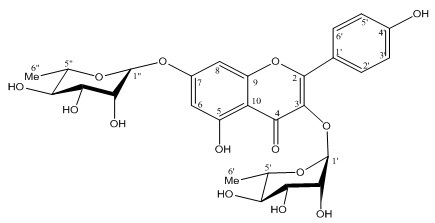 Du J, He Z-D, Jiang R-W, Ye W-C, Xu H-X and But PPH: Antiviral flavonoids from the root bark of Morus alba Phytochemistry 2003; 62(8): 1235-1238. Duc LV, Thanh TB, Thu HLT and Van BN: Chemical constituents and tyrosinase inhibitory activity of aqueous fraction of the leaves of Morus alba L. from Vietnam. Int J Pharmacognosy 2018; 5(7): 399-03. doi link: http://dx.doi.org/10.13040/IJPSR.0975-8232.IJP.5(7).399-03. Authors Address: School of Medicine and Pharmacy, Vietnam National University, No.144 Xuan Thuy Street, Cau Giay, Hanoi, Vietnam.